The inventor of the original Club Protector is William T Held (Bill). Held patented this product in 1989 and formed the company, Club Protector Inc., which has been successfully operating since its opening, supplying cart manufacturers, dealers, private owners and golf courses with its impeccable product. Bill is an avid golfer who wanted to “keep his clubs dry” and did something about it. Bill Held golfed in the inclement weather of Buffalo, New York, where he and his associates considered keeping their clubs dry more important than remaining dry themselves. Rain could not stop Bill from golfing and he could be found on a course during mild snow using colored golf balls. The creative genius that he is, Held began sketching a contraption which operated similarly to a baby-buggy carriage top, meant to attach to the top of of a golf cart and provide shelter for clubs resting on the back of a cart. Since no one prior had generated this great idea, Bill went to work with a patent attorney, mold designers and CAD designers to create and market his revolutionary design. 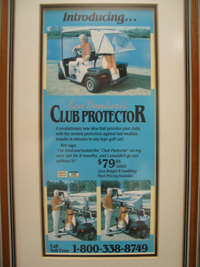 While wintering in Naples, Florida, Bill attached an original Club Protector to his friend, Ken Venturi’s, golf cart. Venturi promoted the item and sales began to soar. Cart dealers, manufacturers, courses and individuals began requesting this new product: the only item of its kind. Because of the specific patent language, others are unable to copy Bill Held’s original design. No replications are able to totally compete with the Club Protector, which holds no water in the down position; attaches very quickly and easily; accomplishes full cart side coverage. None of its competitors address all of these concerns; none have all of the listed elements in one unit. Club Protector, Inc. has now expanded to produce several new models, Including its newest innovation: “The Retractable Enclosure.” Since the retirement of his father, Michael Held has been at the helm and has moved the company forward with unique designs and functional improvements. Within the golf cart industry, the “Club Protector” name is still recognized as the “original” and the “constant” by anyone considering a club protector or enclosure and the company continues to pioneer and champion with new products.